Out Of This World Performance And Energy Savings. 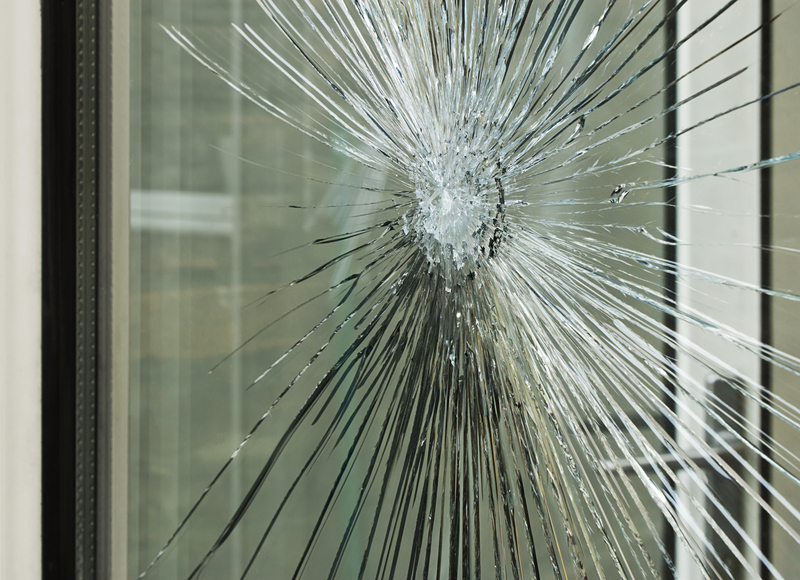 When temperatures soar, ordinary window glass just can’t handle the heat. Tinted glass spoils the view. Conservation Windows’, however, have been specially formulated to reject the sun’s heat without affecting the view. 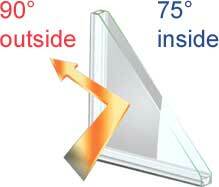 It lets more light in and keeps out the heat so your home stays cool and comfortable. Conservation Windows’ coating provides the ultimate in performance and clarity of all LoE products. It blocks 95% of the sun’s damaging ultraviolet rays so it will help your furniture, carpets and curtains to stay beautiful for years to come. During the cold weather, the insulating effect of your windows has a direct impact on how your rooms feel. Typically, 80% of the exposed surface of a window is glass, and the room-side of the glass directly affects the air temperature in the room. The better insulated the window glass, the warmer your room will be. Solar Heat Gain Coefficient – (SHGC) The amount of solar radiation that enters a building as heat. 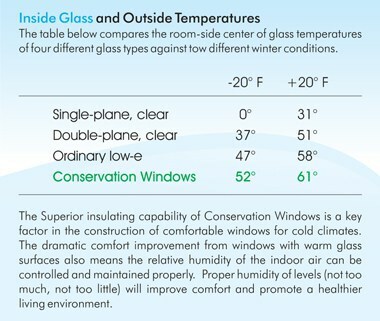 The lower the number, the better the window is at reducing heat loss. U-Factor – This represents the heat flow rate through a window expressed in BTU/hr/ft/F using winter weather conditions of 0° F outside and 70° F inside. The smaller the number, the better the window is at reducing heat. UV and Fading Transmission – These regions include all of the ultraviolet energy and most of the visible spectrum and will give the best representation of UV protection and relative fading rates. The lower the number, the better the window is for reducing fading potential of carpets and interior furnishings. Responsible environmental stewardship is our goal. No matter where you live, Conservation Windows will help you achieve your goal saving resources and money with your heating and cooling. 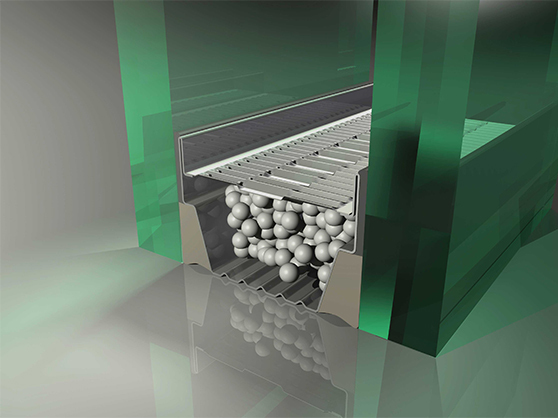 Our Conservation Windows system is a dual glazed insulated glass unit which consists of 3 layers of silver, a stainless steel spacer system, and an air space filled with high density Argon gas. Enjoy the comfort and beauty of your home…all over again by not having to worry about your glass failing. Endu spacers have proven durability years after installation. Holding the industries lowest failure rate, it is clear that endurance is just as important as performance. Year-round comfort and energy savings. 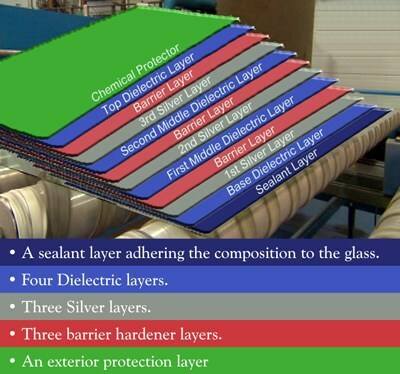 Spectrally selective – The ultimate in solar heat control, fading protection and visibility. Warm wintertime inside surface temperatures with less condensation. Outperforms tinted glass used in warmer climates without darkening your view. Allows you to enjoy your view in the summertime. The perfect window no matter where you live. Bring Performance Into Your Showroom Today!